Originating in ancient Persia and India centuries ago, shisha from the Persian word shīshe (شیشه) meaning glass, is the common term for a water pipe for smoking flavored tobacco called shish in which the vapor or smoke is passed through a water basin before inhalation. Shishas is also known as hookahs, narghile, argil or qalyān. Patrons must be 18 years or older to order our Shisha. 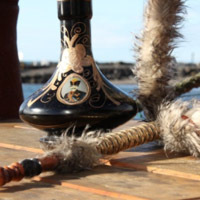 Thanks to Manou, the Taranaki’s very own Persian Prince, you can enjoy Shisha right here in New Plymouth!